Congenital midline labial sinus of the upper lip is a rare condition. This anomaly occurs either in isolation or in association with other congenital malformations such as cleft lip, cleft palate, and van der Woude syndrome. The estimated prevalence of lower lip sinuses is about 0.00001% of the white population, but upper sinuses are even rarer., Till date, only one case has been reported in the Indian population. We hereby report the second case in a 12-year-old Indian male with recurrent swelling of the upper lip since childhood. A 12-year-old male reported to the Department of Oral Medicine and Radiology with a chief complaint of recurrent episodes of pain and swelling of the upper lip since childhood. The patient would take over-the-counter drug, and the pain would subside while the swelling would reduce in size (but never resolved completely). The present episode occurred 3 days back. The pain was sudden in onset and was followed by swelling of the upper lip. The patient had become febrile as well. He denied any history of trauma, and the medical as well as dental history was noncontributory. Family history was noncontributory. On further interrogation, the boy's grandmother revealed oozing of clear fluid from his lip when he was young. On clinical examination, the patient was in acute pain (visual analog scale = 9) and was febrile (101°F). A diffuse swelling was evident on the upper lip. No scar mark or draining sinus was evident. The local temperature was increased. It was tender on palpation and was soft firm in consistency. Lymphadenopathy was absent. Other extraoral findings were within normal limits. On intraoral examination, the patient had a good oral hygiene. Two nodular swellings were evident on either side of the labial frenum. Suppuration point was evident on the swelling [Figure 1]a. It was tender and soft-firm on palpation. Anterior teeth had a normal morphology. The periodontium was healthy. Due to acute pain, the patient refused any investigation and requested medications for prompt relief. He was prescribed a 5-day course of broad-spectrum antibiotics and analgesics with serratiopeptidase. On the recall visit, the swelling and inflammation had reduced significantly. The nodular swellings had reduced in size. Vitality testing and intraoral periapical radiograph of the upper incisors revealed no abnormality, ruling out the possibility of a chronic dentoalveolar abscess. A careful re-examination revealed a pinpoint depression over the philtrum [Figure 1]b. A 20 no. gutta-percha (GP) was inserted into it, and a radiograph was taken using the intraoral periapical (IOPA) film [Figure 2]a and [Figure 2]b. The radiograph did not reveal any foreign body. However, the presence of a sinus tract was confirmed. A diagnosis of congenital midline sinus of the upper lip was made. The patient was recalled for further management by surgical excision of the sinus tract. However, the patient was lost to follow-up. Very few cases have been reported in the literature regarding this condition since the first ever case reported back in 1891 by Lannelongue and Menard. In India, only one case has been reported so far, ours being the second. Aoki et al. in 2011 proposed a classification for upper-lip sinuses. Type 3: Lateral sinus with or without accompanying abnormalities. Failure of complete fusion between the frontonasal and the maxillary process. To the best of our knowledge, only 39 cases have been documented so far.,,,,,,,,,,,,,,,,,,,,,,,,,,,,,,,,,,,,, Of these, 24 are from the Asian subcontinent, suggesting a predilection for this race. Only one case has been reported in the Indian population, ours being the second. Furthermore, mostly affected are females, indicating a female predilection. In our case, the subject was a male contrary to the predilection. Majority of the cases have been reported in the 1–2nd decade, similar to our case. However, the minimum documented age at the time of presentation is 7 months, while the maximum is 47 years. An array of associated congenital malformations can be seen in association with this anomaly. However, most of the cases are devoid of them as with our case. Usual complaint is recurrent swellings and discharge from the defect though some are asymptomatic. Sinus tracts are most commonly found. Fistulas are rarely encountered. Only one case reported the presence of both the sinus and fistula, where a cyst was also reported in association to the fistula. The mainstay of treatment for this condition is its early and prompt diagnosis followed by surgical excision of the sinus tract. Mere antibiotic coverage may simply suppress the infection and inflammation for some period of time, which may cause recurrence of symptoms at a later stage. Patients with a history of recurrent cellulitis of either lip should be carefully examined for any evidence of a pit or a draining sinus and for the evidence of any congenital abnormality. Sometimes, the pit is inconspicuous as was in our case. Hence, prior knowledge of this condition is a must. GP is an inert material. Hence, it is devoid of any allergic reaction (common with dyes). The authors certify that they have obtained all appropriate patient consent forms. In the form, the legal guardian has given his consent for images and other clinical information to be reported in the journal. The parents understand that name and initial will not be published and due efforts will be made to conceal patient identity, but anonymity cannot be guaranteed. Fok D, Kua EH, Por YC. Congenital midline sinus of the upper lip. Singapore Med J 2015;56:e107-9. Coccia CT, Bixler D. Cleft lip, cleft palate, and congenital fistulas of the lower lip. Report of a familial occurrence. Oral Surg Oral Med Oral Pathol 1967;24:246-9. Cervenka J, Gorlin RJ, Anderson VE. The syndrome of pits of the lower lip and cleft lip and/or palate. Genetic considerations. Am J Hum Genet 1967;19:416-32. Bakshi SS, Kiruba Shankar M, Gopalakrishnan S. Midline upper lip sinus: A case report and review of literature. Oral Maxillofac Surg 2015;19:217-9. Lannelongue OM, Ménard V. Affections congénitales. Asselin et houzeau, libraires de la faculté de médecine; 1891. Aoki M, Sakamoto Y, Nagasao T, Miyamoto J, Kishi K. Classification of congenital midline upper lip sinuses: A case report and review of the literature. Cleft Palate Craniofac J 2014;51:154-7. Miller CJ, Smith JM. Midline sinus of the upper lip and a theory concerning etiology. Plast Reconstr Surg 1980;65:674-5. Eppley BL, Sadove AM, Goldenberg J. Philtral fistula in median cleft lip: Cause and effect or coincidence? Ann Plast Surg 1992;29:263-5. Al-Qattan MM. Congenital midline sinus of the upper lip. Ann Plast Surg 2000;44:76-8. Grenman R, Salo H, Rintala A. Midline sinuses of the upper lip. Case report. Scand J Plast Reconstr Surg 1985;19:215-9. Parisier SC, Birken EA. Congenital midline sinus of the upper lip. Arch Otolaryngol 1973;97:259-62. Mackenzie KI. Mid-line sinus of the upper lip. J Laryngol Otol 1970;84:235-8. Bartels RJ, Howard RC. Congenital midline sinus of the upper lip. Case report. Plast Reconstr Surg 1973;52:665-8. Kriens O, Schmidt H, Mueller-Driver O. Congenital lateral fistula of upper lip. A case report. J Maxillofac Surg 1973;1:122-4. Salah BI, Al-Rawashdeh B, Al-Ali ZR, Mahseeri M, Al-Zu'bi Z. Congenital midline sinus of the upper lip: A case report and review of literature. Int J Surg Case Rep 2018;51:41-4. Holbrook LA. Congenital midline sinus of the upper lip. Br J Plast Surg 1970;23:155-60. Tange I. Median cleft of upper lip and its related malformations: (Report of 12 cases). Keisei geka. Plastic and reconstructive surgery. 1965;8:118. Menendez OR. Congenital pit of the upper lip. Oral Surg Oral Med Oral Pathol 1969; 27:441-4. Urade M, Tofani I, Igarashi T, Morioka S, Nishimura K, Usui M, et al. Congenital midline sinus of the upper lip: Report of a case. J Osaka Univ Dent Sch 1984;24:59-65. Watanabe T, Katsuki T, Tashiro H. Three cases of congenital dimples of the upper lip. Jpn JCPA 1981;6:50-4. Katou F, Motegi K. Congenital midline sinus of the upper lip. Report of a case. Int J Oral Maxillofac Surg 1989;18:237-8. Sakamoto H, Imai Y, Asakura A. Congenital midline sinus of the upper lip. Report of a case. Int J Oral Maxillofac Surg 1992;21:10-1. Mizuki H, Shimizu M, Danjo T. Congenital fistula with an island of vermilion-epithelium in the paramidline of the upper lip: Report of a case. J Craniomaxillofac Surg 1993;21:22-4. Asahina I, Sakakibara T, Miyashin M, Tachikawa N, Enomoto S. Congenital midline sinus of the upper lip: Case report and review of literature. Cleft Palate Craniofac J 1997;34:83-5. Shigihara Y, Natsui M. Midline sinus of the upper lip associated with an intraoral polyp. Eur J Plast Surg 1997;21:151-3. Licht A, Posner J, Leipziger LS. Median cleft lip with associated midline sinuses. J Craniofac Surg 1998;9:366-70. Illing HM, Field D, McNamara CM, Sandy JR. Congenital sinus of the upper lip. A case report. Int J Oral Maxillofac Surg 1999;28:29-30. Sumitomo S, Ogawa S, Hirai K, Takai Y. Congenital sinus of the upper lip with idiopathic precocious puberty. Oral Dis 2002;8:308-9. Sancho MA, Albert A, Cusi V, Grande C, Aguilar C, Morales L, et al. Upper lip fistulas: Three new cases. Cleft Palate Craniofac J 2002;39:457-60. Charrier JB, Rouillon I, Roger G, Denoyelle F, Collon S, Garabedian EN, et al. Congenital isolated midline sinus of the upper lip: Clinical and embryological approaches. Cleft Palate Craniofac J 2006;43:488-91. Tuncali D, Barutcu AY, Terzioglu A, Aslan G. Two cases of congenital midline upper lip sinuses associated with miscellaneous deformities. J Oral Maxillofac Surg 2006;64:734-7. Sen C, Agir H, Isken T, Alagoz S, Karadeniz E, Iscen D, et al. Congenital midline upper lip sinus. J Craniofac Surg 2006;17:810-1. Nakano Y, Somiya H, Shibui T, Uchiyama T, Takano N, Shibahara T, et al. A case of congenital midline fistula of the upper lip. Bull Tokyo Dent Coll 2010;51:31-4. Salati SA, Al Aithan B. Congenital median upper lip fistula. APSP J Case Rep 2012;3:11. 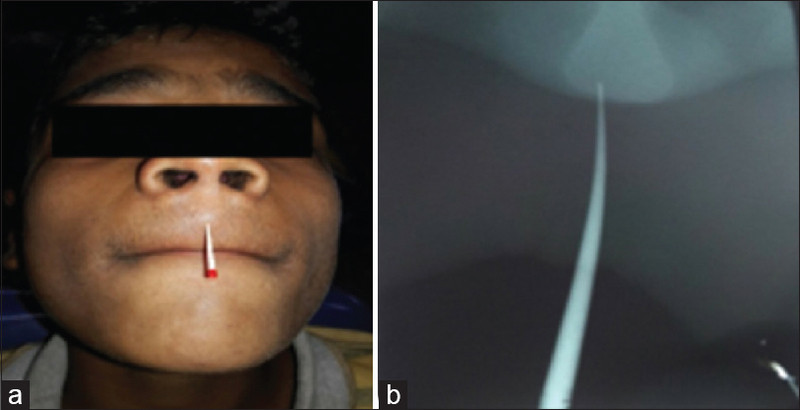 Jung H, Kang S. Congenital upper lip sinus found in adolescent patient: A case report. Arch Craniofac Surg 2012;13:57-9. Anicete R, Khoo I. Congenital midline upper lip sinus: A case report. Int J Pediatric Otorhinolaryngol 2014;9:18-9. Hili S, Wong KY, Goodacre T. Isolated midline upper lip pit. BMJ Case Rep 2016;2016:10. Xu Y, Chen R, Mu Y, Zheng Z. Congenital midline sinus of the upper lip. J Craniofac Surg 2016;27:1306-7.